The Disney Store Back to School Sales: Backpacks for $12 and Lunch Totes for $8! The Disney Store is having a back to school sale! Get backpacks for $12 and lunch totes for $8! Your child can choose from character favorites including Cars 2, Disney princesses, Marvel super heroes, Mickey or Minnie Mouse and more! You can personalize them, too! Get free shipping when you spend $75 or more and enter the code SHIPTODAY at check-out. You can also get an additional 3% cash back when you shop through ShopAtHome.com and a $5 cash back bonus if you are shopping through their site for the first time. If you’re planning a Disney trip soon or if you just love Disney, don’t miss out on this 30% off sale at The Disney Store! You can get sunglasses for as low as $2.09! 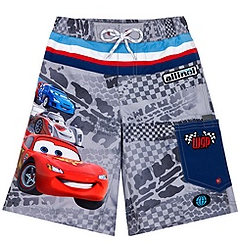 There are lots of other great deals including beach towels, swimwear, sleepwear, and toys! Enter the code BONUS30 to get 30% off. This code is only valid on sale items. Get FREE shipping when you spend $75 or more and enter the code SHIPTODAY at check-out. Get more bang for your buck by getting 4% cash back when you shop through ShopAtHome.com. You will also get a $5 cash back bonus if you are shopping through ShopAtHome.com for the first time. Your cash back will be applied to your account within 30 days. 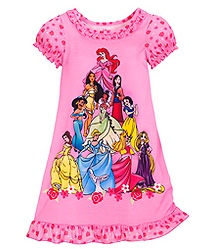 The Disney Store online is having a HOT sale on Disney character tees! 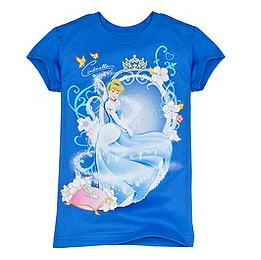 Get Disney Kid Character tees for just $5.99 (regularly $12.50) and adult tees for just $8.99 (regularly $16.50-24.50). If you shop through ShopAtHome.com, it’s the WILD CASH BACK deal and you’ll pay just $3.50 after cash back! If you’re planning a trip to Disneyland or Disney World this summer, get your tees now and save big over prices at the park! This weekend, you can get FREE SHIPPING when you purchase any Brave item and enter the code BRAVESHIP at check-out. 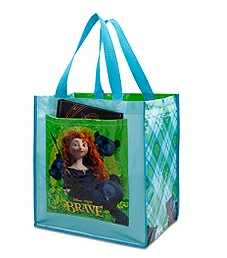 This Reusable Brave Merida tote is just $3.50, which is cheaper than shipping would be in most cases! There are lots of other great items, too! 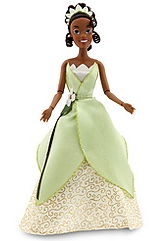 NOTE: The Disney WILD cash back offer from ShopAtHome.com only applies to one item. All other tees will be $5.99. Your cash back will be credited to your ShopAtHome.com account within 30 days. If you are new to ShopAtHome.com, you will also get a $5 credit after your purchase which would make your second tee just $.99! Donald’s Daily Deal today at The Disney Store online is a sale on Disney character tees! Get Disney Kid Character tees for just $5.99 (regularly $12.50) and adult tees for just $8.99 (regularly $16.50-24.50). If you’re planning a trip to Disneyland or Disney World this summer, get your tees now and save big over prices at the park! The newest Donald’s Daily Deal is up at the Disney Store and I’m guessing it will sell out fast! 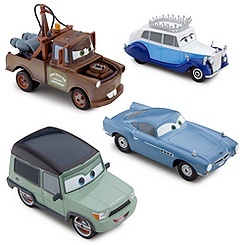 Get Cars 2 Die Cast sets (4 pieces) for just $7.99 each! The regular retail value on these is $29.50! 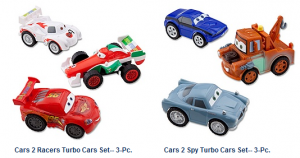 If you’ve got a little one who loves Cars 2, grab this deal! Make sure you check out their “Twice Upon A Year” sale. 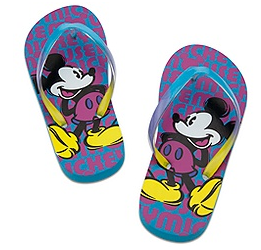 You can save up to 40% on Disney apparel, toys and plush, collectibles, and more! If you’re planning a trip to a Disney theme park this summer, this is a great time to grab some Disney-themed items to give to your kids on your trip so you don’t experience sticker shock at the park. That’s what I plan on doing for our trip! You can get free shipping when you enter the code SHIPTODAY and spend $75 or more. NOTE: You can also get 3% cash back when you shop through Ebates or ShopAtHome.com.